On inshore swiss waters you may drive a powerboat or a sailing boat under power with a maximum of 6 kw (8 HP) without driver‘s license if you are older than 14 years. Over those 6 kw you need a cat. A-powerboats driver’s license and must be over 18 years of age. Caution: on the Lake of Constance you need a driver’s license if the power is over 4.4 kw (6HP). You may sail a sailing boat without a driver’s license if the sail area is less than 15 sqm. If the sail area is more than that, you need a cat. D-sailing boats license. Minimum age herefor is 14 years. Caution: on the Lake of Constance you need a license if the sail area is over 12 scm. 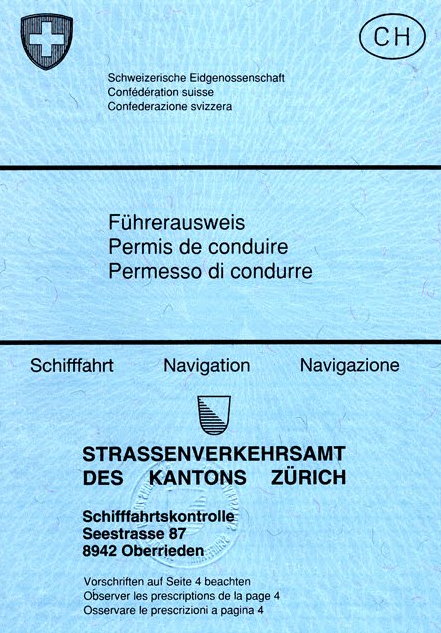 If you apply for a swiss boat driver’s license you have to compile and submit the according form to the Navigation Service of your canton of residence. Usually the exam takes place in your canton of residence. The theory exam can be passed in another canton if you are a temparary resident, i.e. weekly. If you want to pass the practical test in another canton, you can submit an according request to your Navigation Service of your canton of residence, subject to a fee. The future navigator has to demonstrate his knowledge and ability during a theoretical and practical exam. The theory exam for both cat. A-powerboats and cat. D-sailing boats is identical. Who already holds a driver’s license of one category does not have to pass a written theory exam for the other category. Every question contains 3 answers and one, sometimes two, are correct. The exam is passed if you score at least 165 point out of 180 possible (max 15 errors). There is a total of more than 500 possible questions. The authorities can, at any given moment, add and include new questions. Do not learn the questions by heart! With our boattheory.ch learning material you will learn all the principles to pass your exam with ease. The exam questions can be trained with the App boattheory.ch for iPhone, iPad, Android and Blackberry Smartphones and palmptops. The theory test is valid for 24 months. The practical boat exam can be taken taken only after the theory exam. During this exam you have to demonstrate that you are able to drive and navigate a boat and are familiar with rules and regs. The practical test has to be taken on a boat of the category for which you apply. The practical test for category D-sailing boats can only take place if wind force is more than 2 Beaufort. Do you have questions regarding the practical exam ? Contact us. We would be glad to be of help.